The melaleuca genus of the Myrtaceae (Myrtle) family is also known as tea tree oil and only comes from trees and shrubs located in Australia, this oil has always been one of my favorites and is a must have in the first aid kit. Along with be strongly antiseptic it aids the immune system, respiratory system, skin, muscles and bones. This variety of Melaleuca is more gentle than the alternifolia variety and does not irritate the skin. It also has calming, sedative properties making it useful for insomnia and better suited for use with children. It is however not as potent as alternifolia. 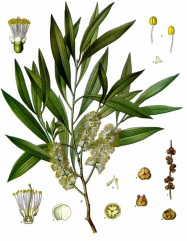 This variety of Melaleuca has a sweeter, more delicate scent than that of alternifolia, along with the uses listed below it also aids in concentration and helps to clear the mind. This variety of Melaleuca is listed as Cajeput and has a page of it's own, here. skin healing, rashes, hives, boils, sores, warts, etc.